From time to time the restless railfan needs to grab a camera and get out in the sunshine. Anthony F. Krisak by all reports was one of those railfans that would head out with his camera in hand. With Krisak there was one difference from most railfans in that he was a talented photographer and he had a 4x5 Speed Graphic camera which together made for superb photographs. What follows is a small sample of photos by Anthony F. Krisak from the Richard A. Krisak collection. It represents railfan outings over a 25 year span starting with a National Railway Historical Society excursion on the Ohio Public Service Company in 1938 and ending in 1963 with an afternoon at the Ohio Railway Museum in Worthington. 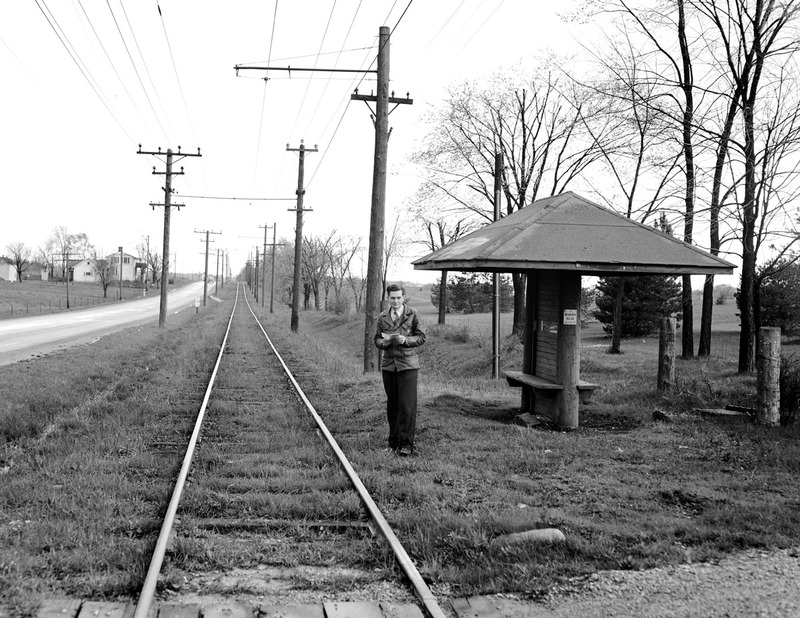 Mr. Krisak (1922-1984) lived in the Cleveland area where following WW II service in the US Army he was a motorman on the Shaker Heights Rapid Transit line for 28 years. 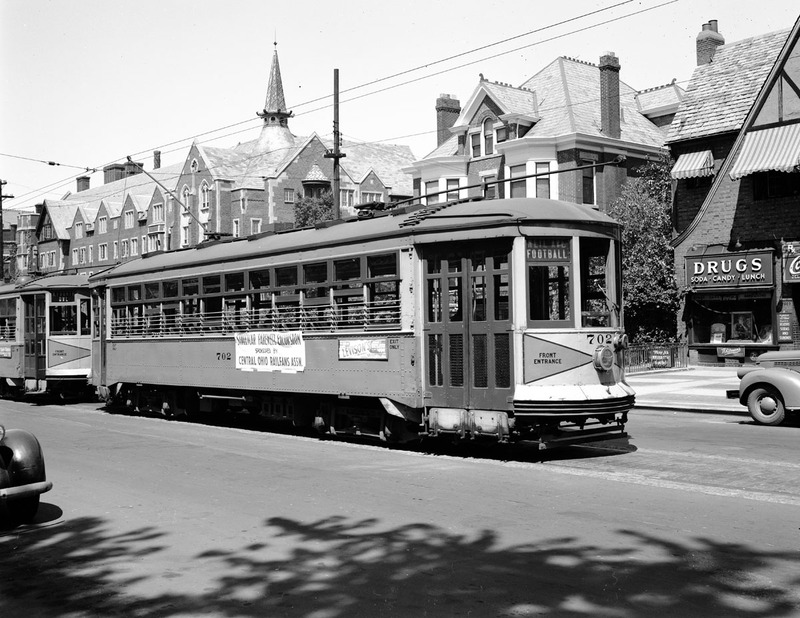 More of his photographs can be seen in Cleveland and Its Streetcars, By James R. Spangler and James A. Toman, Published by Arcadia Publishing, 2005. Ohio Public Service No. 21 in excursion service. It’s likely Mr. Krisak took this photo July 3, 1938, while on a National Railway Historical Society sponsored trip. 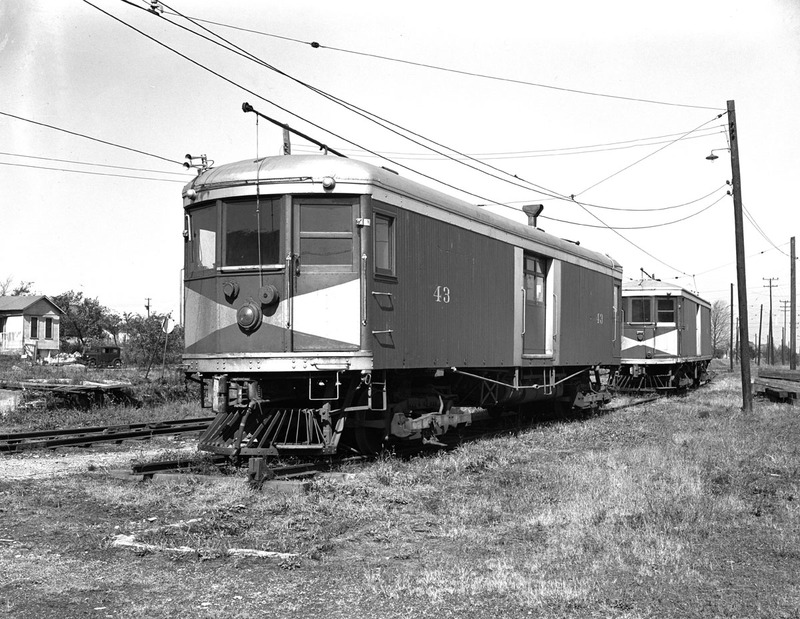 The OPS, originally named the Toledo Port Clinton & Lakeside Railway, served Toledo, Oak Harbor, Port Clinton, Marblehead and Bay Point where passengers could catch a ferry boat to Sandusky. 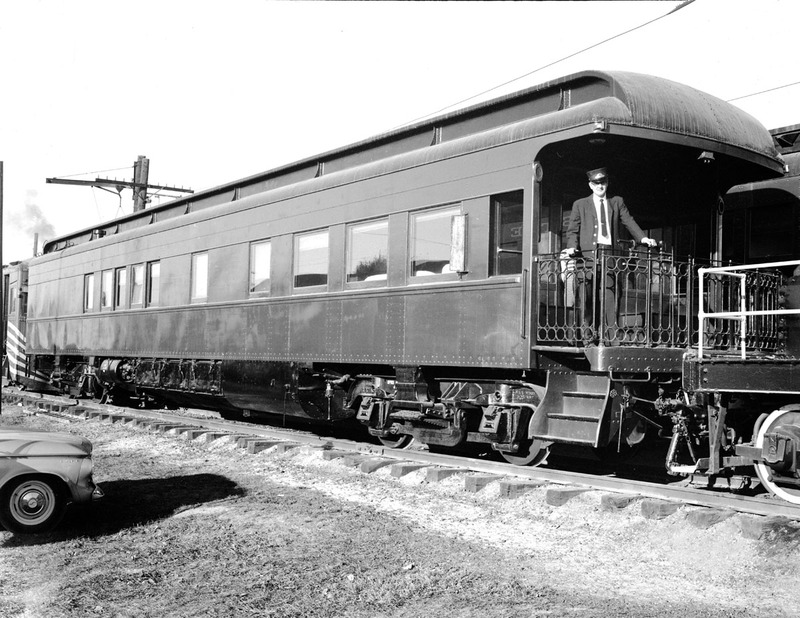 In 1939 passenger service was abandoned. 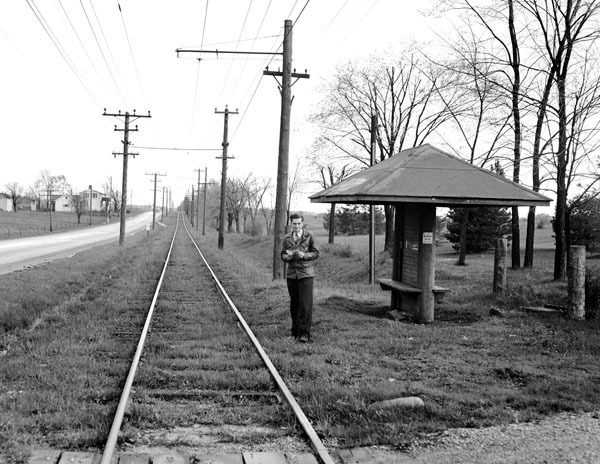 A short segment of right-of-way would be retained as the Toledo & Eastern Railroad Company until July of 1958. The T&E served a dolomite quarry at Clay Center. Click here for the 1938 OPS trip flyer. This 1946 photo is of No. 21 showing its age after several years of sitting behind the car barn at Oak Harbor. By 1946 the Akron Chapter of the NRHS owned No. 21. Having decided they weren’t able to properly care for the car the title was transferred to the Central Ohio Railfan’s Association. CORA moved the car to the Ohio State Fairgrounds in Columbus. In 1948 it was moved to Worthington starting the Ohio Railway Museum. Click here for information on OPS No. 21. Ex-Columbus Delaware & Marion Electric Co. No. 300 at the Marion Reserve Power Company's power plant west of Marion on the Scioto River. This small remnant of the CD&M had two ex-CD&M freight motors and one line car. 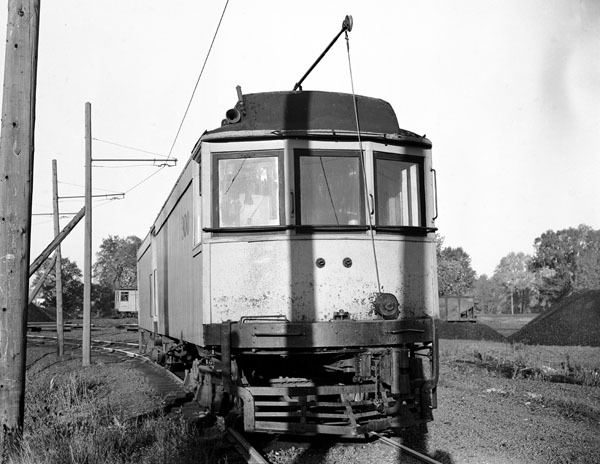 Line car No. 102 is visible in the background. The 7 ½ mile line was used to haul coal from the Chesapeake & Ohio Railroad to the power plant. The photo was taken in 1946. The line ceased operation in 1952. Click here for a photo of freight motor No. 301 on the CD&M. The Marion Reserve Power Co. right of way with rails kept shiny by coal trains heading to the MRP power plant in the distance. 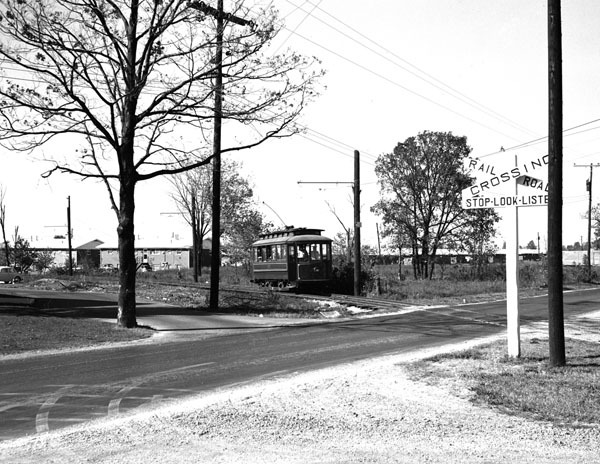 The line ran alongside Prospect Pike since renamed Marion-Marysville Road. Anthony Krisak our photographer is standing by the old CD&M waiting shelter. The photo was taken October, 1946. Click here for information on the Columbus Delaware & Marion interurban. On that same October, 1946, day Mr. Krisak stopped by the Ohio-Midland Light & Power Co., a coal hauling remnant of the Scioto Valley Traction interurban line. These two ex-SVT freight motors spotted in Obetz, were used to haul coal from the C&O RR at Groveport and the N&W RR at Obetz to the Picway Power Plant along the Scioto River. 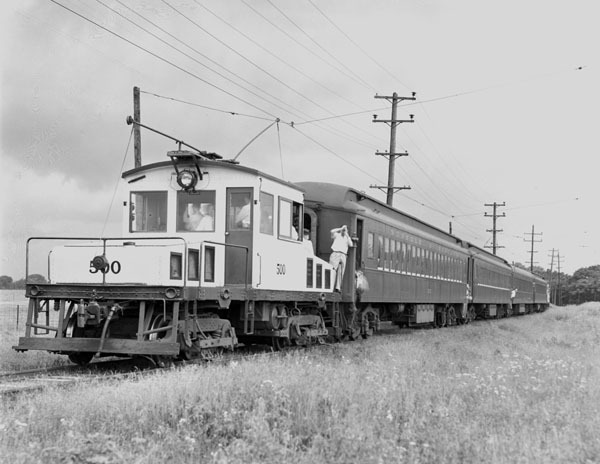 Click here for information on the Scioto Valley Traction interurban. The storage barn at the Columbus & Southern Electric Company’s Kelton Avenue shops in October 1946. When built the barn was used to store off season streetcars. 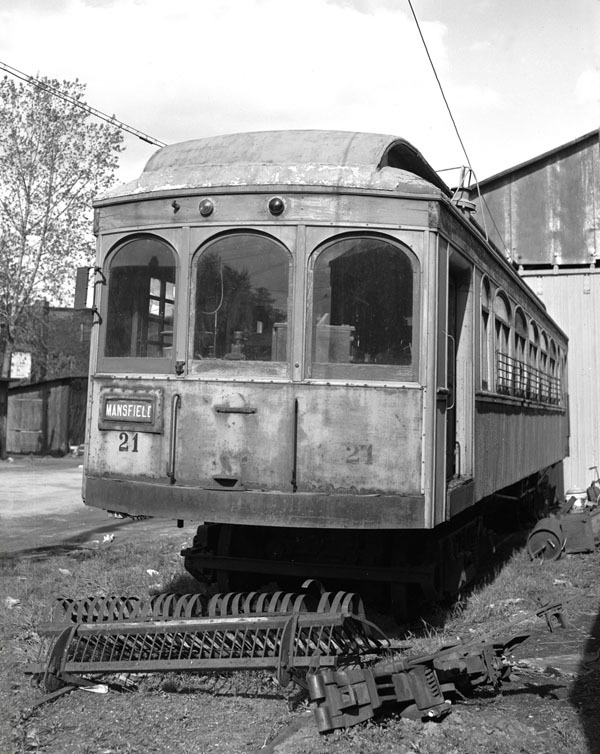 Toward the end of streetcar service the yard was used to dismantle and scrap streetcars as they were replaced by trolley coaches. The intricacies of mixing the two wires needed for trolley coaches with the single wire used by the streetcars are visible in the overhead wires. September 1948 the Central Ohio Railfan’s Association sponsored a Columbus streetcar farewell excursion using two streetcars. No. 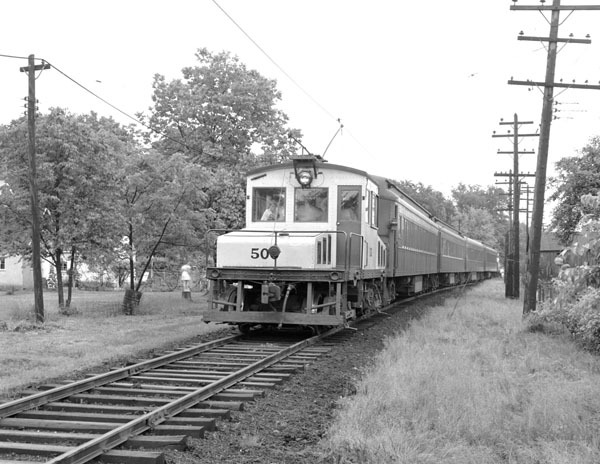 702 is in Bexley at the end of line – E. Main Street at S. Drexel Avenue. No. 851 was the second car. 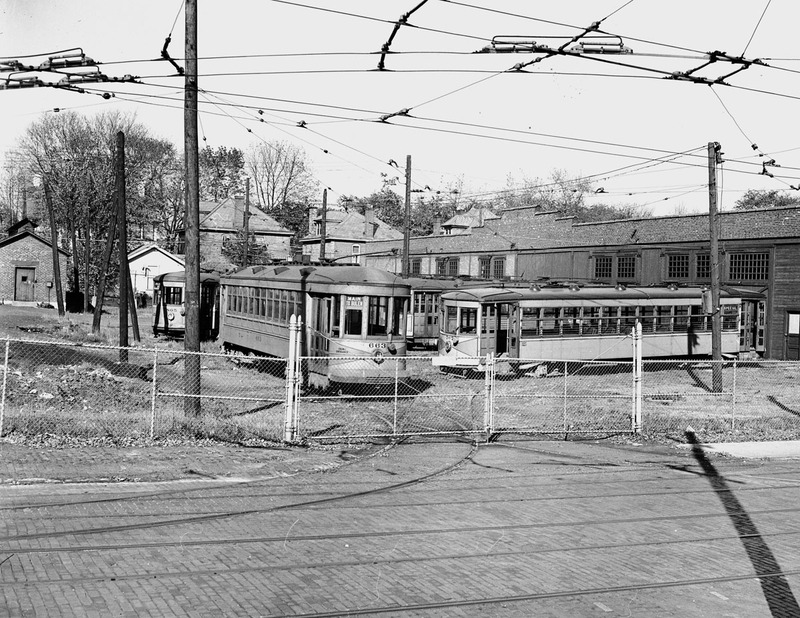 The other end of the Neil-Main streetcar line was Neil Avenue at W. 11th Street. Ohio State University’s Mack Hall is visible on the left. The sigh reads "Streetcar Farewell Excursion". The Main-Neil car line tied OSU with Capital University in Bexley. 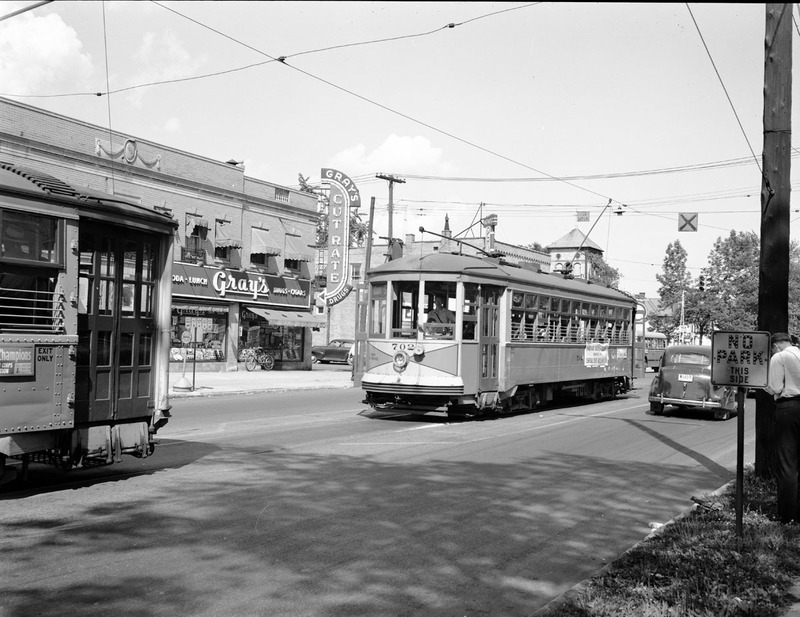 Many a student from both schools took the streetcar to central Columbus for a movie or trip to the Lazarus Department Store. It’s 1949 and we are back on the Ohio-Midland Light & Power Co. 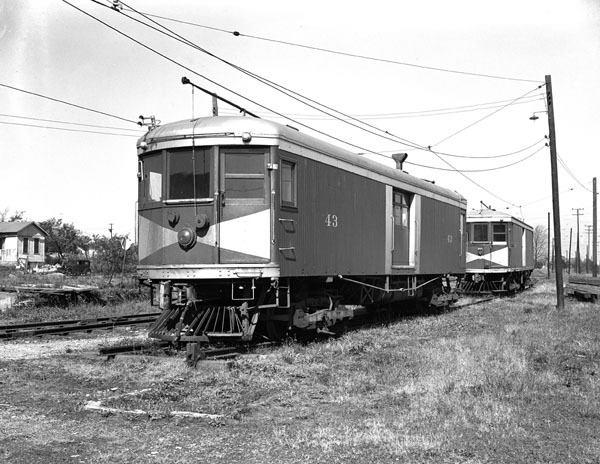 Since the photo showing the two freight motors in 1946 the OML&P has replaced them with two steeple cab motors purchased from the Springfield Suburban Railroad Co. in Springfield, Ohio. The photo was taken during an excursion, the first passenger train on the old Scioto Valley Traction track since 1930. The N&W brought the four car excursion train to Obetz from Columbus Union Station. On the OML&P a steeple car was attached to each end of the string of four cars and the excursion continued to the Picway power plant, a trip of about ten miles. Click here for the 1949 N&W/OML&P trip flyer. The SVT and OML&P used third rail for power once away from the villages. As you can imagine the railfans were not allowed off the coaches in third rail territory. The third rail pick up shoe is visible attached to the steeple cab trucks. The Ohio Railway Museum's ex-PRR business car Willamsport with our photographer, Anthony F. Krisak, on the platform. It must be steam day on the ORM with a wisp of smoke visible in the background. In front of the business car is Eire gas-electric No. 5012 and behind it Columbus & Southern Ohio Electric Co. steeple cab No.2. Next to the business car is the ex-N&W combine. The three ORM photos were taken in 1963. Four-wheel streetcar No. 472 is crossing Proprietors Road at the ORM. No. 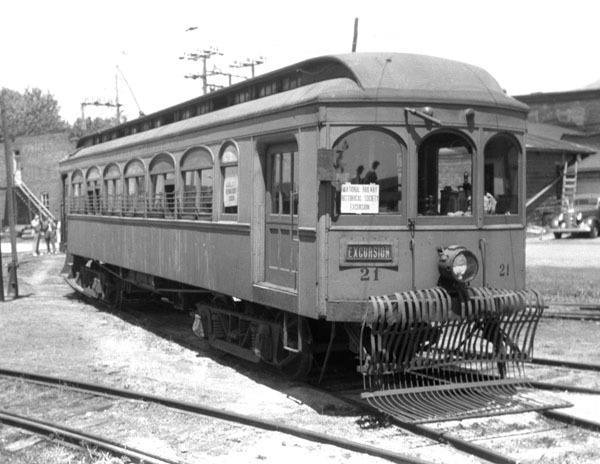 472 is very similar to four-wheel streetcars that ran in Columbus. The car, built in 1900, is actually from Kansas City. The pride of the ORM, Ohio Public Service No. 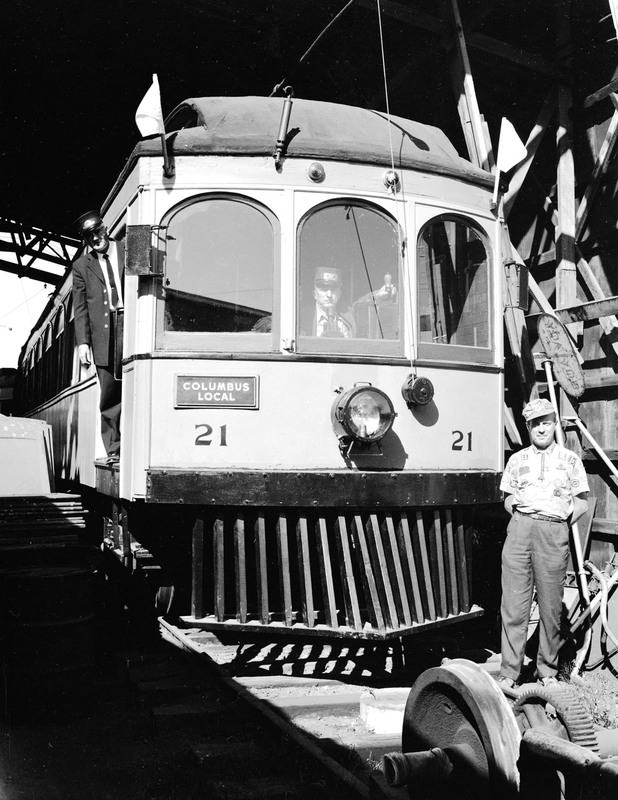 21, in the ORM carbarn. Anthony F. Krisak is standing in the baggage door, John Gaydos is at the control stand and Ronald Peoples is standing on the ground. The three friends came from Cleveland to spend the day at the Ohio Railway museum.